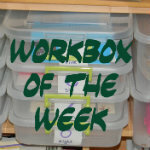 This week's Workbox of the Week is Margaret's name box. Now, this box is not in her rotation every day, but I try to make sure it is in there at least three times a week. It is a great way to help her learn the letters of her name, recognize the letters in her name, spell her name, and write her name. I put letter cards or letter magnets in her box. You could even make these from index cards. We identify the letters and then she places them in order to spell her name. Next, she writes her name. I have prepared this name sheet for her using paper that I purchased from Handwriting Without Tears. You get over 100 of these block sheets for $5.50. She's getting better at it everyday! These workbox ideas are great. I am taking notes for when Emma is a little bigger (and less prone to dumping workboxes). One of our favorite cheap activities is to make a "sewing block" out of plastic canvas and the kids will practice different kinds of stitches and make patterns by sewing it with plastic Rexlace or thin shoelaces. You can get the plastic canvas in colors and in different hole sizes. What a great way for little ones to learn to spell their name!! Stopping over from the crew and now following! Have a great week! !